It is a sunny day in the Marche region, plus… Today is the happiest day of my life. D’you know why? I started writing this series because I wanted to share something that was just mine. I wanted to show you my personal attitude, which is what helps me going on with my life and career. This coffeece is a small space, I know, but I hope that it could become wider and happier day by day! I’ve met a lot of people over this year and it has been astonishing. There are so many beautiful, inspiring souls out there. I would like you to get to know them all better. I will keep on searching; I will keep on discovering what lies beneath the surface. We are all different, we have that je ne sais quoi making us special, we can make the difference, and we can change the future of both our profession and the world. I know, it sounds a little too picky, but – trust me – we have the power. We can do ANYTHING! I can see a crowded coffeece! Do you recognise these smiling, funny faces?  Maybe, yes. Hi, guys! Please, make yourself at home. How are you? 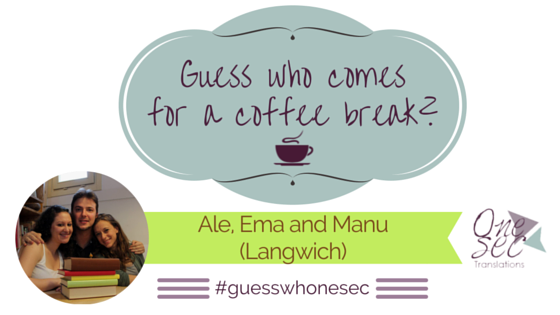 Well, let me introduce Alessandra, Manuela, and Emmanuele of Langwich to you! Well, my papers are ready to be read. I am going to ask you six sets plus a Bonus Qs section of questions covering your personal profile rather than the professional one. Today, you are going to answer the first three sets, then on Wednesday the remainder of them. ▷ A: Hello! My full name is Alessandra Rotilio – I don’t have any middle names, just nicknames. My official one is Ale, but my colleagues call me in many different ways: Alozzi, Alozzi-san, Alozzerrima, and more. I know what you’re thinking: that’s when the nickname gets even longer than the name! ▷ E: Emmanuele Raffaele Bernardini. ▷ M: Manuela Gallo, my parents don’t like middle names. They’ve given me loads of embarrassing nicknames though. My brother and my closest friends call me Manuzza. ▷ E: Ha-ha. I’m a full-time freelance translator. Used to be a barman before that, though. ▷ M: Thank you, Ale, I love you too. I’m an English and Spanish into Italian translator and subtitler. I’ve recently added food and wine to my fields of expertise. I also teach English in a primary bilingual school. ▷ A: My birthday is on the 9th day of the 9th month. Yes, 09/09/99 was quite a day. ▷ E: No problem at all. I was born on 20th January 1981. ▷ A: For people like me, the question should be “How short are you”. I’m 154 cm above sea level. ▷ E: I’m 193 cm tall, or 6’4” if you prefer. ▷ M: 160 cm of pure nerdiness. ▷ A: I’m a Virgo. I’m no Zodiac expert, but the general features often used to describe the sign match me quite well – meticulous, reliable, practical, analytical, overcritical. ▷ M: Cancer: moody, emotional and loyal. ▷ A: I live in Nichelino, a small town just outside Turin. Not exactly the place to be though, I hope I’ll be moving soon. ▷ E: I lived in Viterbo and Rome until I was 11, then my family moved to San Benedetto del Tronto, a nice, small town on the Adriatic Sea. Lived there with my parents until I was 19, then moved out to Pescara for my university years. I spent the summers of 2005 and 2006 working as a barman in Bavaria, Germany. Finally, in 2010 I moved to Turin, where I live and work now. ▷ M: Born and raised in Turin, but part of my heart belongs to Calabria, where my mum comes from. ▷ A: I generally love bright colours. ▷ M: All the hues of blue and green. ▷ E: I had no clue until high school. Then I discovered I had a real knack for languages, and from there it was pretty much a no-brainer. ▷ M: At first a ballerina, though I’ve never attended a single ballet lesson. Then, a professor of Italian literature (because I love books). Finally, when I was in high school my dream of becoming an all-rounded language professional took shape. ▷ E: I used to have a cat and a dog when I was a kid. Nowadays I can’t, because that would limit my freedom to travel. ▷ M: I admit it: I’m one of those people who love watching videos of cute kittens sleeping or playing. ▷ A: Tea! I’m an atypical Italian, no coffee whatsoever for me. ▷ E: Coffee, hands down. I’m caffeine-powered! ▷ M: There’s nothing like the aroma of coffee wafting from my moka pot to wake me up in the morning and make me feel at home. ▷ A: Night – I work better later in the day and I tend to go to bed late, too. ▷ E: A few years ago I’d have picked night. That’s not the case anymore, though. ▷ A: Sea. In the last few years, I’ve been enjoying wonderful holidays at the sea with my colleagues. And I just couldn’t ask for more. ▷ E: Sea. Can’t live without it. ▷ M: Definitely sea. I’ve spent most of my summer holidays in Calabria since I was a baby and sat hours and hours on the beach alone listening to music or reading. ▷ A: Namastay in bed – I’m definitely not an early bird. ▷ M: I can’t really say I get up as the sun is up. I love cuddling up in the protective cocoon of my blankets, especially in cold winter mornings. ▷ A: I’ve played the piano for four years when I was at high school but I quit at a certain point. I regret it but I needed a lot of time and patience I didn’t have back then. ▷ E: Yes. I have been playing the electric guitar as a hobby since I was 19. The results are meh at best, but I haven’t had a lot of time to put into my training, so that’s to be expected. It’s still fun though. ▷ A: My ipod, my mobile and my camera. Today you can have the three in a single device, but I still enjoy having a 30 GB ipod and a digital camera. ▷ E: Nowadays, my DSLR. ▷ M: My glasses. If I lose my contact lenses, I’m virtually blind! ▷ A: I’m a proud vegan and I love eating anything whose production hasn’t caused pain to an animal. ▷ E: Mediterranean food, hands down. All of it. ▷ M: Pizza and dark chocolate. They’re my comfort food, I’d eat them at any time of the day. ▷ A: I love cooking! Being a vegan, I enjoy experimenting new recipes, especially ethnic dishes. ▷ E: I’m pretty good at it; Carbonara Pasta is my forte. ▷ A: Sneakers and heels, but not very high ones. My feet just can’t be bothered. ▷ M: The last time I wore high heels was at my brother’s wedding… and I feared for my life! Jokes aside, I like heels, but only for special occasions. • Clean-shaven, stubble, mustache or beard? ▷ E: Either clean-shaven or stubble. ▷ E: I’m a lazybones who really loves basketball. ▷ A: Taboo is the best board game ever. I’ve had some of the best laughs ever playing Taboo with my friends. ▷ E: Scrabble can be really fun. ▷ M: I totally agree with Ale! I love Taboo, and I’m pretty good at it too! ▷ A: My favourite writer is Daniel Pennac. I love the Malaussène saga. I’m reading Journal D’Un Corps, by Pennac. ▷ E: I have a lot of books that I like and it’s really hard to pick one. For brevity’s sake, I’ll say Jonathan Livingston Seagull because of how inspiring that book was to me when I read it. In San Benedetto, there is also a beautiful monument dedicated to it that overlooks the whole harbor, and I really love that spot. ▷ M: Hard question for one who has mountains of books at home… Anything by Jane Austen, Luigi Pirandello, Daniel Pennac and J.K. Rowling. I’m currently reading Neverwhere, by Neil Gaiman. ▷ A: I’m not a geek but I can generally control technology – certainly not the other way round! ▷ M and A: Pc. ▷ E: Not really an Apple fanboy, sorry people. ▷ A: I love Facebook. I find it a great way to keep in touch with people from whom I wouldn’t be able to hear that often because they live in other countries. ▷ E: I don’t like them, but Facebook is the one I find myself using more often. ▷ M: Facebook. The truth is that I started to use all the others only last year. ▷ M: When I was a child I used to spend hours and hours playing Super Mario on the Nintendo NES with my brother. • If yes, what’s your favourite video game of all time? ▷ M: Super Mario and Unreal. This is amazing! You are so funny and lively! I would love to talk to you more, but – unfortunately – we are running out of time and there is a lot more to say – we need more time! So, hold on! We will be back on Wednesday! This is your [Christmas] week, guys! I can’t wait to share your next answers!  If you are curious, as well, just stay tuned! Follow me and the Langwich team to read the latest updates! Who’s Langwich? ▷ Alessandra, Emmanuele and Manuela are the minds behind Langwich, a close-knit team of three freelance Italian translators and great friends based in Turin, specialising in audiovisual translation and localisation. They work with English, German, Spanish, French and Portuguese. Language gourmets, foodies and pun lovers. You can find them on Facebook, Twitter, Instagram and LinkedIn.